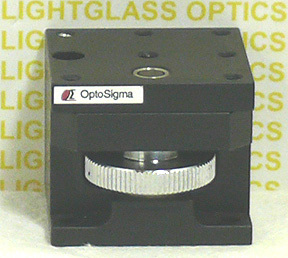 The OptoSigma 123-3440 40mm Preset Dovetail Stage Z is 34mm tall overall, and offers travel of 5mm. The top stage plate has 6 #6-32 holes on .625" centers, as well as an #8-32 hole in the center. The Z axis is moved with a thumbwheel. Precision, made primarily of brass.